Yesterday crowds flocked to nibble a Giant Cupcake in Covent Garden. At about the same time over in East London the Olympic Stadium - known fondly by some as the 'cupcake' - had its final roof bit moved into position, completing the elliptical shape. The thing isn't all fitted out yet, but the structure was completed in just over a year, and with just over 3 years to go until the first Opening Ceremony. 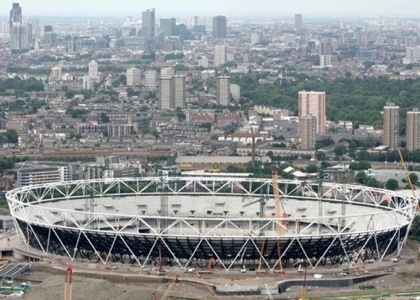 As Londoners we should feel a bit of pride that our stadium for 2012 is in place - in 2009.